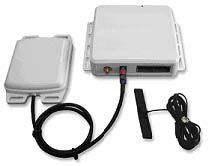 IQgistics IQ800 is a compact, fully-integrated cellular (GSM/GPRS) and satellite (Inmarsat D+) GPS tracking unit. Until now, interfacing to multiple networks was a difficult and time-consuming task involving numerous interfaces, differing message formats, and mis-matched hardware. IQ800 provides a standard, manufactured two-in-one solution and features an effective least-cost routing method that combines the affordability of a cellular connection with the reliability and global coverage of satellite. Download the technical specs. IQgistics IQ800 Satellite/Cellular Hybrid Tracking unit is a dependable, fully integrated D+/GPRS wireless controller. It sets the standard for reliable asset tracking and management systems at a low combined total cost. The IQ800 ensures that your applications are delivered with lowest cost message routing using GPRS/EDGE networks when your assets are in cellular coverage, and automatically switches to Inmarsat D+ satellite network where necessary, maintaining a critical lifeline link to your fleet. Assets moving anywhere in the world are visible and reachable at all times by your fleet operations.